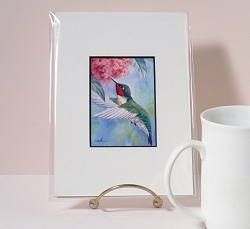 Have you ever had a close encounter with a hummingbird? It's quite an experience. One day some years ago while working in my garden on a bright summer day, I heard a loud buzzing noise coming from the direction of my car. It sounded like a gigantic bee. Curious, I went over to see what it could be and realized the noise was coming from one of the wheel wells. Bending down and looking very closely, I could just make out a tiny wing sticking out from under a flap of plastic. It was then that I realized the noise was coming from a bird which had gotten trapped under the car. I gently lifted the flap and an exhausted hummingbird hopped out and onto the top of the tire. It sat there for a bit until I put my finger out. Then it hopped onto my finger. I brought it out into the light and let it rest in my hand. When it had finally recovered, it took off like an arrow toward a tree across the yard. What an experience to hold one of these tiny birds! 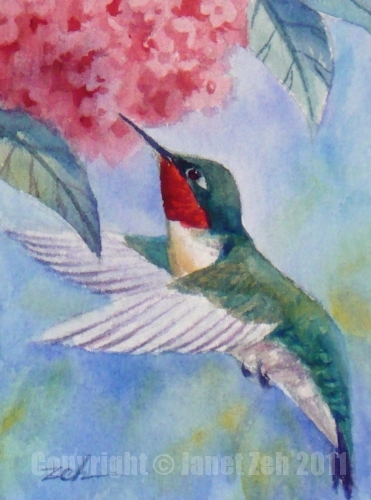 Oh how I love the hummingbirds! Last summer I was inside and kept seeing this "object" zipping past the window in the living room out of the corner of my eye. Curious, I got up to see if I could determine what it was. It turnd out to be a beautiful hummingbird that was visiting my blooming flowers! He continued to come back daily for about a week, I guess until all the nectar had been consumed. You did a fantastic job capturing the beauty of this bird.